It’s funny, the things you can find when you sift through the backup files from various old computers. You can find old pictures that you thought you had lost. Half-finished notes, poems, a tidbit of an email you thought you might send before you thought the better of it, and just let it sit there. Or, you can find a little document, only 24 pages in total, entitled simply “Open Letter.” It seemed innocuous enough, so I opened it. Six months of entries, here and there, some longer than others, but they all started the same. The hurt, so far removed now, bled on the page. In each letter, I danced and skirted around the words, like I still do. I couldn’t say “Dear Mom: It’s been eleven days since you died.” No, I couldn’t write those words. I thought it, I know I did. But my fingers wouldn’t type those words. It was always something like “since you found peace.” Since you passed. Since the light touched your face and I knew you were finally free. Do I believe all of the above? Yes. I sincerely do. Dead. You are dead. You died three years ago. Dead. There. I said it. More than once. It is just a word. Of course, most of you know me. I am silly and old fashioned. I know words shape us, as much as we sing and plug our ears with our fingers we know that sticks and stones may break our bones, but words will forever scar us. Or mold us. We are the words we come to love or hate. It has been three years and sixteen days since I last held your hand, kissed your cheek, and laid next to you. I still miss you. The hurt is still there, but it no longer feels like a gaping empty vastness of all the things that might have or should have been. I see you now when I close my eyes and think about you. I don’t see the sickness, the illness, the pills, the morphine patches, the syringes full of liquid sustenance. The hurt and shame you tried to hide because you couldn’t face the fact that you needed someone else. I don’t see that anymore. I don’t see your death. Or you dead. I remember it, but more than anything, I remember you, Mom. I remember the Mom who hovered like a giant over me, who could protect me from anything. I remember the way you laughed with your whole soul, and I felt the world open up before me. I remember the walks and the banter and the singing, and the arguing. I remember the white-lipped look of rage you got when someone hurt one of your babies. It used to embarrass me, that look, because it invariably meant that someone was about to get a piece of your mind. And everyone in earshot was going to hear it. A part of me couldn’t say the word “dead”, couldn’t really think it, because there’s that part of me that doesn’t believe you’re dead. I held you in my arms. I saw your chest fall that final time and I heard the release of your last breath. Yes, this is all true. But in the corner of my eye, I still see glimpses of an almost six foot woman, close cropped graying hair, in a pink sweater. Sometimes she’s on a bike, sometimes just crossing the street, or picking up a piece of garbage on the side of the road, and I stop and take a second look. The woman is never you, but there’s often something so familiar in the scrunched shoulders and a look of hurt in her face. When I see her, I smile, because I feel you. I bet most of the women think they’re encountering a crazy lady, smiling at them as if she knows them, but you know what? To hell with ’em. Some of them, well, they smile back. Literally speaking, you are dead by all modern concepts. I have your certificate of death. But much like the medieval period, there is factual truth, spiritual truth, and symbolic truth. And as St. Augustine once intimated (if memory serves me correctly, since it has been many years since I read De Civitate Dei), I do believe factual truth is the lesser of these truths. Why? Because I still feel you in the earth, in the grass beneath my feet, in the wind, in the sun shining on my sweet daughter’s face, in the joy I feel when she points to the sky and yells “Buh! Buh! Buh!” at the passing birds. You are free. Free of all the hurt, guilt, pain and sadness you carried with you. You are free. I knew it when I saw your face relax, a smile tickle at the side of your mouth, and the pained look that I had seen on your face for so many years finally melt away. I saw that peace when you died. And Mom? Wherever you are, there is one thing I do know for sure – you will always be with me. And I will always love you. A few days ago, I found myself looking through various Christmas plants, trying to find just the right one to bring to my Mom. For some reason, I couldn’t find one anywhere I went. And while I couldn’t find the right plant or flowers, I knew she probably didn’t care. It was just my mission. To let her know I still think about her. Every day. 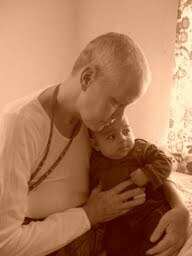 And how much I wished I could have seen her hold my daughter- just once – before she left us. So, you can imagine my surprise (and tears) when I opened up my Christmas present from my sweet, sweet husband. Gramma Christine finally gets to hold her granddaughter. 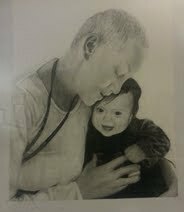 My husband’s only request to the artist was that the drawing reflect the joy the two would have felt if they had ever met in person. I think he succeeded. In spirit, I know my mom would have held her exactly like this. And I am so grateful that a moment like below could happen, a picture I am posting with permission from my amazing sister, Dark Moon (a.k.a. The Monster in Your Closet). It is obviously the inspiration for the above picture. I am just so happy my mom was able to meet at least one of her grandchildren, so each of us could see the joy she would have had in ours. Even in her last moments, there was so much tenderness. So much light. Merry Christmas, everyone. I know mine has been amazing. Well, I apologize, it has been a few weeks since my last blog entry. Things have been pretty hectic in this Rambler’s world. The Rambler family just got back from a trip to the East coast, and it was action packed! What a wonderful trip. I have so much love for this amazing family of mine – and that laughing baby girl and her two sharp little teeth! That being said, this wouldn’t be a post of mine if I didn’t include a few random segues, so here goes. Earlier today, I was driving and just feeling so incredibly blessed. Things are strange at work, sure, but that stuff comes and goes. Overall, I’m happy where I’m at, and happy to have the family and friends that I do, even if being a new mom means I don’t get to see them quite as often as I used to. My biggest fear had always been loss. Perhaps my ambivalence about the usual fears (spiders, monsters, fires, falling, etc) can be traced to the violence I was raised with – watching my mom get beaten, hiding my own black-eyes at school, the bruises, and explaining away the oddly headshaped holes in your bedroom wall that you try to forget happened because you looked at your parent wrong…. Surprises can make your heart beat faster, unpredictability can leave you feeling shaken, but loss… You can recover your balance, and your heart beat will usually slow back down, bruises will fade, bones will heal, but loss? Things lost don’t come back. I don’t know why I was so morbid, even at an early age. My earliest nightmares were about haunted houses and forests, but I wasn’t afraid of the ghosts. I was always afraid of what they would take away from me. I would clutch the hands of my siblings, trying to drag each one of them to safety, only to look around and see that I had lost one or all of them. That I had let go of their hand, and they were gone, experiencing some unimaginable horror. As a child, I used to stand on my tiptoes on a chair by the window in the living room, poking my eyes to the tall window so I could watch and wait for my mom to get home. Every night, I was convinced it would be the night that I wouldn’t see her beaten clunker’s headlights round that corner. That would be the night she didn’t come home and someone would come to tell me she was gone. I expected loss, but was so afraid of it. I think this is why I was so persistent with my mom’s mental illness – all those nightmares of me on the outside, watching her drown as I beat against the glass wall, trying to break it and free her; standing alone in a murky forest, calling her (or my siblings’) name, and suddenly turning to the dark part of the forest, the FORBIDDEN part, and knowing to the depths of my soul that she had gone there and that if I followed her, I would never come out… I always woke up just as I stepped into the fog, my heart racing, like those dreams that force you awake because you know you with certainty that death is approaching. I always stepped into the mist in those dreams, because standing on the outside wondering felt so much worse – I couldn’t stand the thought of someone I loved lost, hurt and wounded, and me standing idly by. It wasn’t just my mom I dreamed about – it was the same dreams over and over, with the characters constantly changing. My mom, my siblings, my husband, everyone I cared deeply about, they came to play a role in these nightmares. The House dream was one of the worst. Sometimes I lost my little brother, sometimes it was my little sister, sometimes everyone. For some reason, in the dreams where my older sister was lost, in those dreams, everyone died. I think she always seemed the most able, so if she floundered, I knew I had no hope. The first dream about the House, it was my little brother I lost (I realize now that my little sister hadn’t been born yet, which dates this first nightmare to my being 6 years old) – I was looking for my mother in this large antique house with ornate carpeting. I went down a spiral staircase and saw her standing above a seated man, talking to him and laughing. I’m about to yell in relief at having found her but then I see the man’s face – it’s rotten and skeletal, flesh dripping and one eye hanging from its socket. I muffle a scream as I realize that my Mom is lost to this dead, rotting man. She’s succumbed to this creature’s magic and I know full well that am too little to drag her away. Then I remember that my sister and brother are in the House, too. I need to find them and drag them out the front door, before the monster’s magic somehow steals them and traps them in the House forever. Somehow, I find them, grab their hands and pull them down the hall way that seems to get longer and longer, the carpet coming alive and twisting, grasping at our ankles. Somehow, my panic keeps us going forward, and I pull and pull, trying to drag my siblings to safety until I feel hands slip through my fingers and my brother sinks into the carpet, and I watch his screaming face disappear with feeling of utter failure and loss…. That fear drove me, powered every fiber of my being for such a long time. Only now, so so many years later, do I realize that it wasn’t loss I was afraid of. It was letting go. Luckily, with loving friends and family and a sweet husband who assures me that he is just tardy, so I don’t need to call him every 30 seconds to make sure he isn’t lying in a ditch somewhere – well, I’d like to say that I am cured of my fear of letting go. But that would make me a liar. And I hate lying. I feel heartache that my mom suffered through her mental illness so alone, but I don’t feel responsible any more. I can kiss her fingers and let her walk into that shadowed forest, knowing she could have found her way back to me. She wouldn’t have wanted me to enter the dark to find her – all I needed to do was wait at the edge for her, and she would return to me. It’s the same with my siblings and my husband – I needed to learn that I could trust people to come back, trust that they would tell me if they were hurting and alone, and trust that if I just let go… they would be all right. And I can know, with great warmth in my heart, that I loved them, trusted them, and, even if something horrible happened, that that love followed them wherever they might go.